Are data usage fees killing your digital lifestyle? Enjoying broadband access on your PC but paying through the nose for the same access on your phone, tablet, and other devices? Time to save money by stepping into the future with today’s discount software promotion, Connectify Hotspot MAX! Connectify Hotspot MAX transforms your PC into a wireless hotspot, empowering you to share the Internet with other devices. With Connectify Hotspot MAX, you’ll be able to instantly provide speedy wireless connectivity to your phone, tablet, media player, e-Reader, and other computers. You’ll be the most popular person in the room once your friends realize that they can connect to sweet, free WiFi through your computer enabled with Connectify Hotspot MAX! There’s even support for multiple languages, emoji, and Unicode. Plus a Wired Router Mode for devices without wireless components. 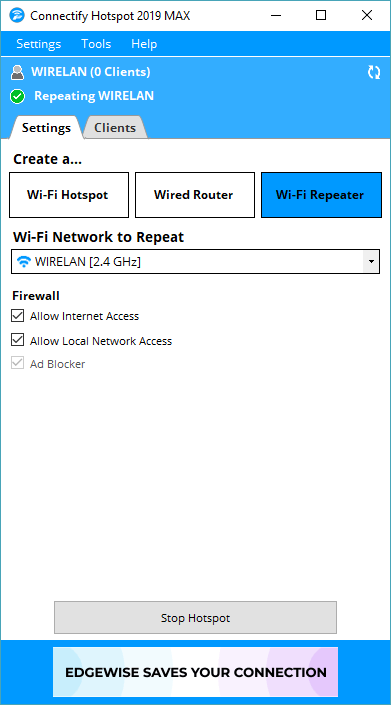 An interesting feature of Connectify Hotspot is its universal ad blocker. All devices connected to the PC that runs Connectify Hotspot will save traffic, time and battery life. Plus – most important – Connectify’s ad blocker works for in-app ads. If you find those annoying, then Connectify Hotspot is perfect for you! Ever wanted to share a VPN connection with all your devices, so your privacy is completely protected and you can access region blocked content without restrictions? It’s very easy to do this with Connectify Hotspot. Just select the VPN connection as the one to share over WiFi or Ethernet and you’re all set. Watch the video below to see how it’s done. After you purchase Connectify Hotspot MAX it may be used indefinitely. Connectify Hotspot MAX is licensed per user, so if more people are going to use Connectify Hotspot MAX you will need to purchase additional copies. P.B. User I am looking for a solution to provide me with a (temporary) wifi hotspot as soon as I plug in an usb wifi adapter. With the built-in Windows solution, this is possible but not in an elegant manner (I currently poll to check for the adapter every minute). Would Connectify Hotspot be able to solve this in a more elegant fashion? Cristian Yes, the Connectify Hotspot license offered through BitsDuJour is a Lifetime MAX one. P.B. User My question above is still open... Would you care to reply now that this is on offer again? Patrocle Misu They have v2018, and here is for sale v2017? Constantin Florea @Patrocle Misu, I am sorry about the confusion. The version number shown on this promotion page was indeed for the previous version however we were and are always selling the latest version of the product. I updated the version number (2018) into this promotion page. haotian User Waiting for the key.Why not send it with the confirming email at once(Saying that I have to contact you by email)? Constantin Florea @haotian User, I have just sent you an email. John User Four hours ago I paid for this software using PayPal. I was notified that I would receive via email the registration details. I have not yet received. Constantin Florea @John User, I just sent you an email regarding the issue you mention. John User After receiving the password and setting this up I have to say it works great. I did have to buy and install a wifi device as I am using an old computer, but once I did I found it easy to set up using the excellent instructions provided. Definitely worth the price I paid for this software. Thank you. Mark K I used the original Connectify when it first came out and was very happy how it worked. I’m now using a Deco Mesh network in the house. Does Connectify care what my laptop is connected to, to be able to share my WiFi connection? Cristian Connectify Hotspot will be able to share any type of connection via WiFi. If you're switching between several connection types, it's best to select "Automatic" under "Internet to Share". What is the advantage of this product?? Connect all my devices? Thats already done with my WIFI, no idea why connecting all devices is a selling point? Please explain. Cristian Connectify Hotspot is a virtual router software that runs on any Windows 7+ version. It allows you to share any type of Internet connection (including VPN) via WiFi or wired Ethernet. It can also act as a WiFi Repeater / WiFi Bridge. 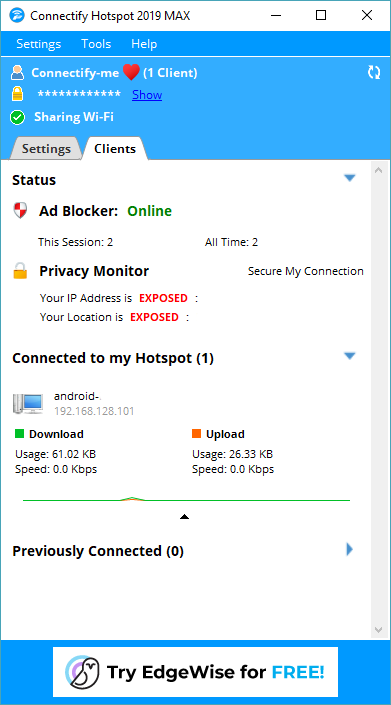 It has a universal ad blocking engine that can even block in-app ads on your mobile devices connected to your Hotspot. Cristian @Radko User - Thanks for your interest in our product and apologies for the delayed answer. 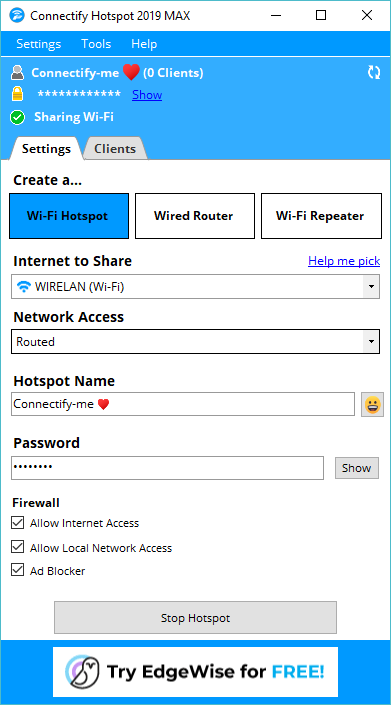 To answer your question: Connectify Hotspot is a software for Windows PCs to share ANY type of Internet connection (WiFi, Ethernet, cellular, tethered smartphone, Bluetooth, VPN, etc.) via WiFi or Ethernet. In the case you described - sharing your home internet connection on your laptop with your phone - one of the benefits would be the universal ad blocker which would eliminate all ads on websites and in apps on your smartphone. I highly doubt that any computer WiFi card or even router for that matter has a range of 1 km, to get your phone WiFi coverage at that distance. You can find a lot of use cases for Connectify Hotspot on our website in the footer section: https://www.connectify.me. Also - if you didn't get to buy Connectify Hotspot via BitsDuJour because were waiting for our reply, please contact us directly at support@connectify.me. Cristian @Daniel Bragg - Thanks for your comment. 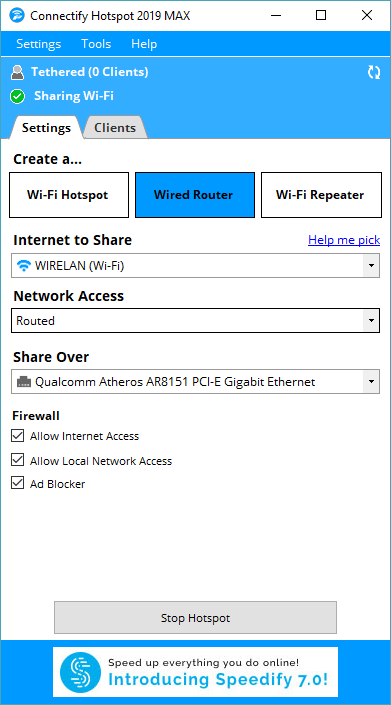 Some clarifications: Connectify Hotspot can share ANY Internet connection (WiFi, wired Ethernet, cellular, Bluetooth, external USB adapters, VPN virtual adapters) via WiFi or wired Ethernet. So, you can share WiFi via the same WiFi - you don't need 2 separate ones. Also, there are devices that don't accept VPNs running on their environment directly - like gaming consoles or Chromecast-type streaming devices. The only requirement for the PC is to have an active Internet connection and at least one of the 2 types of adapters to share over: WiFi and/or wired Ethernet. Manage Multiple Network Profiles with Ease!